I missed something from my post about the Sisterhood Sketchbook the other day. 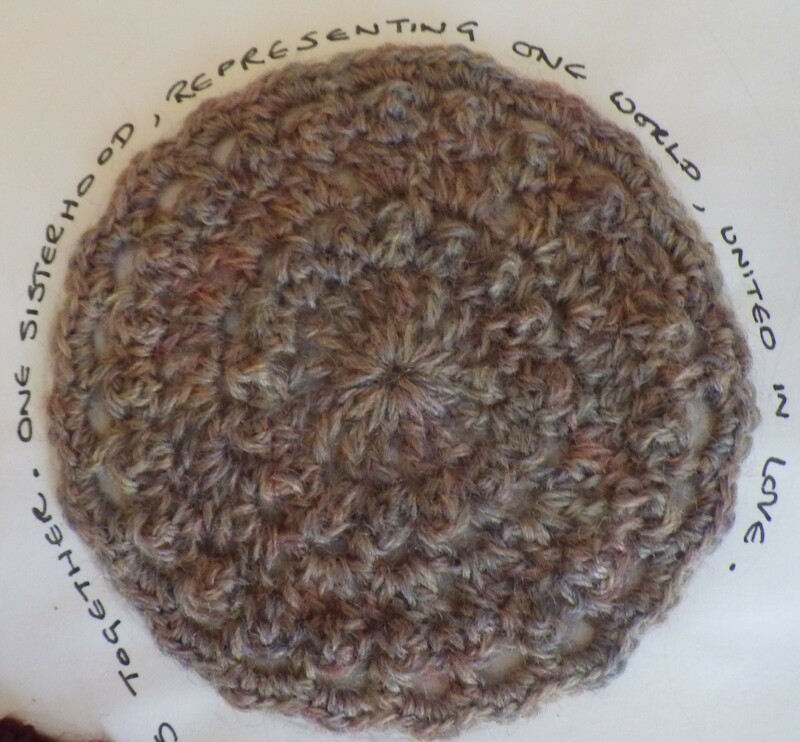 I mentioned my mandala inspiration, but I failed to explain the one circle in my creation that is made from a single yarn. For the Sketchbook it seemed appropriate to incorporate this design (unusual in that it requires you to turn it over and crochet in the reverse direction for several of the rounds). The wool that I selected looks, at first glance, like a rather dull pale brown, but look closer and you will see the diversity in there. Just like people, there is so much more to this element of my Sketchbook contribution than first appears. * I realise that many of my newer readers were not part of the story of the Masterpiece… I promise that I will write a post telling you all about it very soon. Oh, how lovely… I hope you find some inspiration. I’d love to zoom in, but can’t. Can you link the posted photo to the media file in your library, so we can click on the image to enlarge it? Oh, sigh… the old editor defaulter to being able to zoom in, but the new one doesn’t… I’m sure WordPress uses the word ‘improved’ only to refer to things that that are easier for them. I’ll see if I can put it right. OK – does that work? It’s easy enough to fix, you just select ‘Media file’ in the Link drop down menu when you’re inserting a photo. I think it’ll currently be showing ‘None’ in the link box. Tialys had the same problem. You just have to remember to select it for all your photos! Because one click just isn’t enough!! How appropriate that the circle was modified from a pattern called circle of friends! I love the circle of friends pattern, Jan. Oh how I wish I could hold the book one more time. Did you have fun paging through all that goodness? I know I did. Your contribution is perfection. Oh wow, was the Masterpiece really THREE WHOLE YEARS AGO?! I remember that from my very early blogging days. The “Circle of Friends” could have been designed for this project, and I love the yard you used – there’s a lot going on in that colourway when you​ look more closely!